Make self-care part of your 2019 New Year’s resolutions! Take full advantage of the health benefits a hot tub provides and enjoy an investment that contributes to your overall wellness routine. A home spa should be a source of enjoyment, relaxation, and provide you with the most healthful experience to follow through on your resolutions year-round. Since a home hot tub is just steps away from your door, there’s no need to make a commitment to drive to a gym or spa to stick to your resolution, making it easier to stick to your self-care wellness resolutions. Soaking in your hot tub can help you sleep better, reduce anxiety, and is a relaxing way to spend quality time with your family and friends. 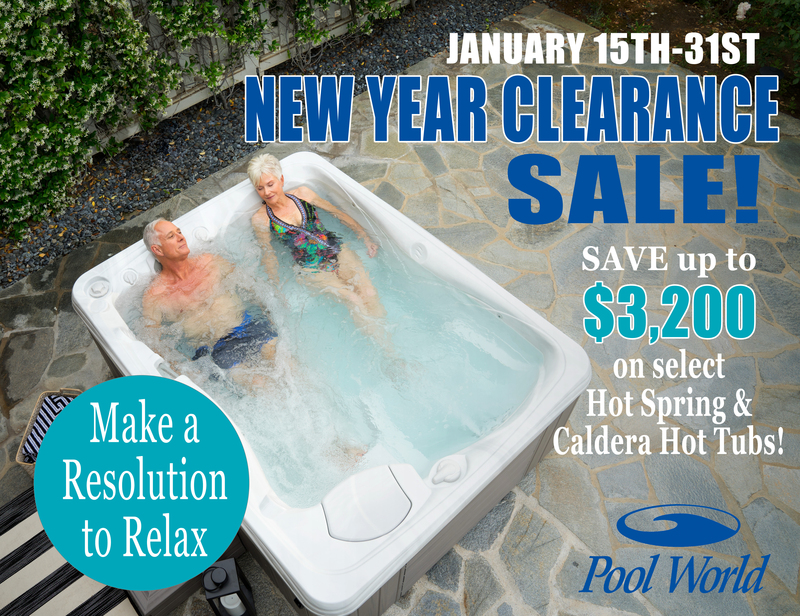 To make owning a hot tub easier, Pool World is having their New Year Clearance Sale packed with HUGE SAVINGS! Over 100 spas are available for immediate delivery, and save up to $3,200 off select Hot Spring & Caldera spas. Stop by one of our 4 locations today or call us at (509) 928-6585. 9111 N Country Home Blvd.